Choose this day whom you will serve… But for me and my house, we will serve the Lord. Josh 24.15. I really like this passage in Joshua. He has been with the Israelites since the Exodus from Egypt. He has seen them suffer in the wilderness, heard them grumble about their hardships and seen them turn their back on the God that delivered them. He has seen their fickleness and wishy-washyness. And yet, God grants them chance after chance and delivers them to the promised land. It is an amazing story of God’s faithfulness, even in spite of our unfaithfulness, and it is also a reminder of the choice that we all must face. Through Joshua, God lays out his resume for the Israelites to hear. He reminds them of what He has done, and where He has led them to, and then He asks them to turn away from the false gods of the land they occupy, and worship and serve God alone. Joshua tells them the choice is theirs, but then leaves no doubt where his loyalty lies. This is the story that came to mind when I read the story of Chris Maragos – free safety for the Seattle Seahawks. In this article from Badger sports (from a couple years ago), you can read about the trouble he got into in High School, and when looking back, he says it came from the emptiness of living life without purpose. The truth is that we were created for a purpose – the purpose of honoring and serving God. That is the only way that this life makes sense. And without this purpose in place to focus on, and pursue, our life seems empty. But once we encounter God, and chose to live for Him, then our purpose is easier to see, and life begins to make sense. Maragos chose to follow God and live for Him. 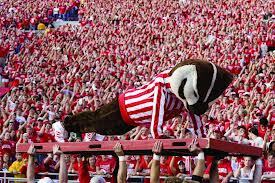 He went to U of Western Michigan, before joining his brother, Troy to University of Wisconsin (His brother was the Wisconsin mascot, Bucky, at the time read the funny Sports Spectrum story!). He used his time there to strengthen his game, and more importantly his faith in God. Now he is a member of the Seattle Seahawks, and a new father. He also runs a football camp (its free for 8th grade and under)The verse that he quotes as his favorite is one of mine as well. Matthew 6.33 – Seek first the kingdom of God and his righteousness and all these things will be added to you. So many things battle for our attention, for our time and energy. It is easy to get distracted and put other things ahead of God – and that is when the feelings of emptiness returns. But when we put God first, and live how He wants us to, then we will have a purpose for our lives, and He will provide all we need. Will you join me in making Christ #1 in our lives, and living for the purpose that He has for you?